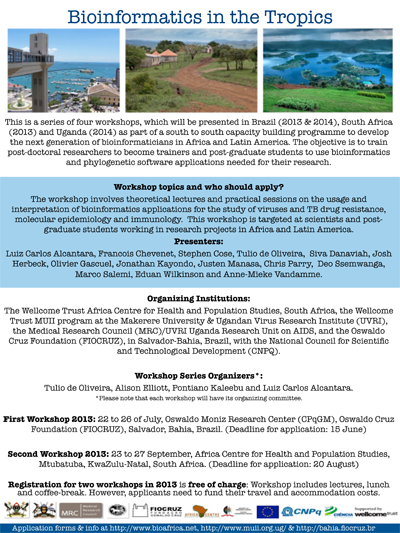 This is the first workshop of the bioinformatics in the tropics series, which will be presented at the Oswaldo Moniz Research Center (CPqGM), Oswaldo Cruz Foundation (FIOCRUZ), Salvador, Bahia, Brazil, 22 to 26 July 2013. The workshop involves theoretical lectures and practical sessions on the usage and interpretation of bioinformatics applications for the study of viruses drug resistance, molecular epidemiology and immunology. This workshop is targeted at scientists and post-graduate students working in research projects in Africa and Latin America. The bioinformatics in the tropics series is part of a south to south capacity building programme to develop the next generation of bioinformaticians in Africa and Latin America. To apply, please visit the FioCruz workshop website. Fernanda Khouri, LHGB/CPqGM/FIOCRUZ, Salvador, Bahia. Katherine Stott, Ph.D. University of Cambridge, Cambridge, Inglaterra. Renata Guerra de Sa, Ph.D. Universidade Federal de Ouro Preto, Ouro Preto, Minas Gerais. Tulio de Oliveira, Ph.D., Africa Centre for Health and Population Studies, Nelson R Mandela School of Medicine Oliveira. Ph.D. Africa, University of KwaZulu-Natal, Durban, Africa do Sul. Registration for workshops in 2013 is free of charge: Workshop includes lectures, lunch and coffee-break. However, applicants need to fund their travel and accommodation costs.